In January 1942 over a thousand Italian prisoners of war, mainly captured in North Africa, were brought to Orkney. They were needed to overcome the shortage of labour working on the continuing construction of the Churchill Barriers. These were the four causeways designed to block eastern access to Scapa Flow following the sinking of HMS Royal Oak with huge loss of life by a German U-boat in 1939. 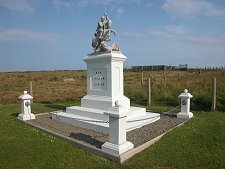 Prisoners of war were prevented by treaty from working on military projects, so the barriers were said to be primarily causeways linking the south eastern islands of Orkney together, which is what they remain today. The causeways are not all that remains to remind us of this period. 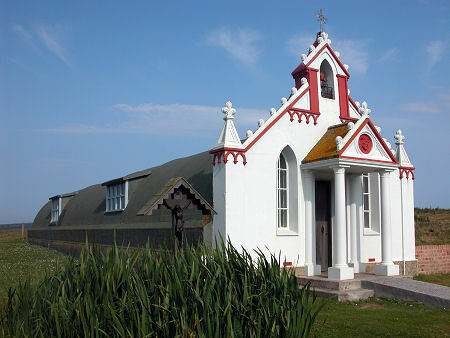 On a bare hillside on the north side of the little island of Lamb Holm, overlooking the most northerly of the Churchill Barriers, is what has become known as the Italian Chapel. The Chapel, together with a nearby concrete statue of St George slaying the dragon and an Italian flag fluttering atop a pole are all that remain of Camp 60. In the centre of the camp, one of the prisoners, Domenico Chiocchetti, produced the statue of St George you can still see today, fashioned from barbed wire covered with concrete. The prisoners also worked to produce a theatre and a recreation hut, complete with three billiard tables made, perhaps inevitably, from concrete. One thing Camp 60 did lack was a chapel. In 1943 the camp acquired a new commandant, Major T.P. Buckland. 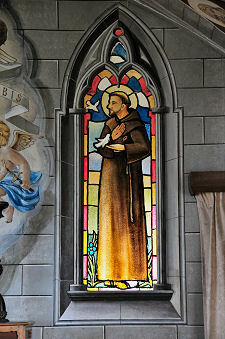 He favoured the idea, as did Father Giacobazzi, also known as Padre Giacomo, the Camp Padre. 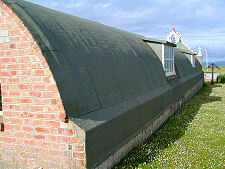 Late in 1943 two Nissen huts were provided. They were joined together end to end, with the intention of providing a chapel in one end and a school in the other. 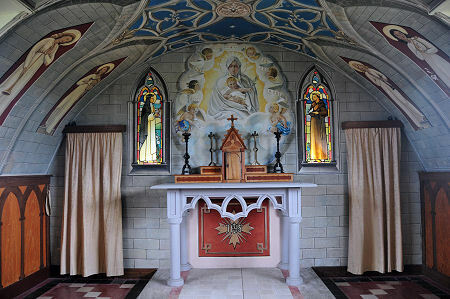 The work of turning the Nissen huts into a chapel fell to the prisoners themselves, led once more by Domenico Chiocchetti. 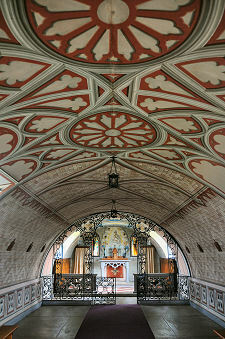 The interior of the east end was lined with plasterboard and Chiocchetti started work on what is now the sanctuary. 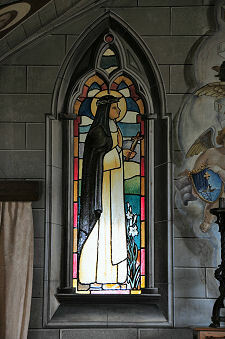 The altar and its fittings were made from concrete and were flanked by two windows made from painted glass. The gold curtains either side of the altar were purchased from a company in Exeter using the prisoners' own funds. 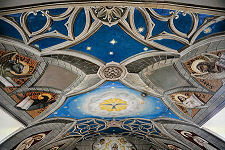 Chioccetti then set to work on the painting of the interior of the sanctuary. The end result is a work of art that is magnificent even to jaded 21st Century eyes, and must have been utterly stunning to those imprisoned here. 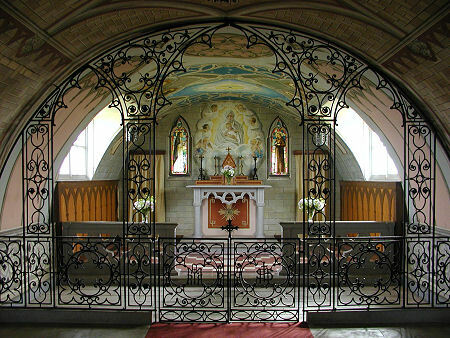 Another prisoner, Giuseppe Palumbi, who had been a blacksmith in Italy before the war, spent four months constructing the wrought iron rood screen, which still complements the rest of the interior today. The contrast between the east end of the double hut and the remainder was by now so stark that the decision was taken to improve the whole interior of the structure. This in turn was lined with plasterboard, before being painted by Chiocchetti and others to resemble brickwork. This showed up the plainness of the exterior of the chapel, so a number of the prisoners built the facade you can see today, again largely from concrete. 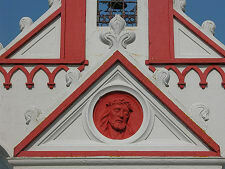 The new facade had the effect of concealing the shape of the Nissen huts behind it, and came complete with a belfry, decorated windows, and a moulded head of Christ above the door. 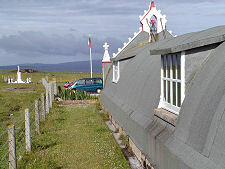 At the same time the metal exterior of the huts was coated in concrete. 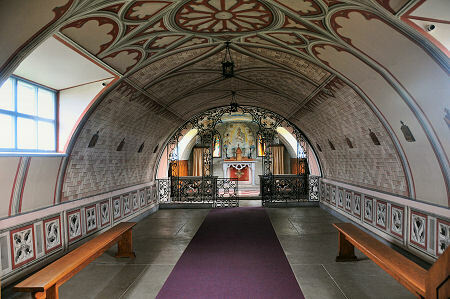 The change in Italy's position towards the end of the war meant that the chapel was only in use by the prisoners for a short period of time. It was still not fully finished when most of the Italians left the island on 9 September 1944, bound for a new camp in Yorkshire, while Chiocchetti stayed behind to complete the font. 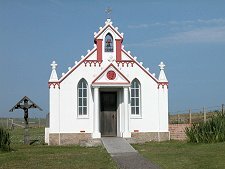 Before the Italians departed the Lord Lieutenant of Orkney, who also owned Lamb Holm, promised that the Orcadians would look after the chapel they had created. 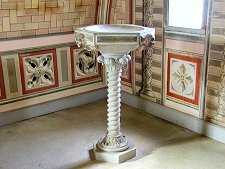 During the years after the war the chapel increasingly became a visitor attraction, and in 1958 a preservation committee was set up. In 1960, the BBC funded a return visit to Orkney by Domenico Chiocchetti. 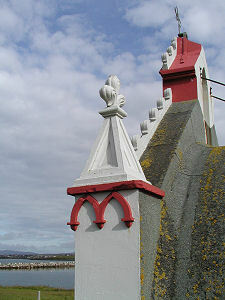 His restoration of the paintwork was followed by a service of rededication attended by 200 Orcadians, and broadcast on Italian radio. 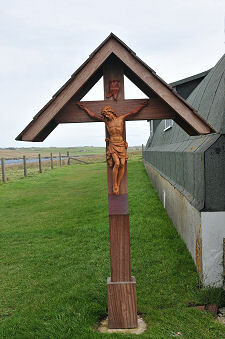 Domenico Chiocchetti returned to Orkney again in 1964 with his wife, and gifted to the chapel the 14 wooden stations of the cross on view today. 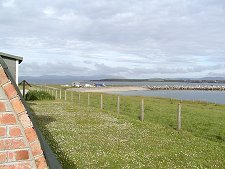 In 1992, 50 years after the Italians were originally brought to Orkney, 8 of the former prisoners returned, though Chiocchetti was too ill to be with them. Domenico Chiocchetti died on 7 May 1999 in his home village of Moena, aged 89. 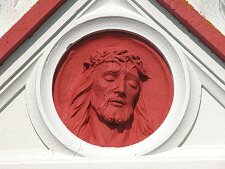 He did so in the knowledge that his masterpiece would live on as a tribute to his artistry and to the spirit of all those involved in its construction and preservation. We first visted in 2002, and again in 2004. 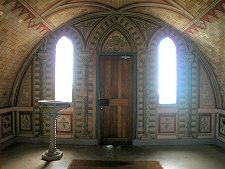 The Italian Chapel was undoubtedly magnificent, but on both occasions felt oddly empty, in a way that left us wondering what the future might hold for it. A return visit in 2018 found that a small and very much "in keeping" visitor centre had been built close by and that a modest charge was being made for admission. This seems a very positive development, as it provides an income to ensure the chapel can be maintained and will be admired and enjoyed by future generations.